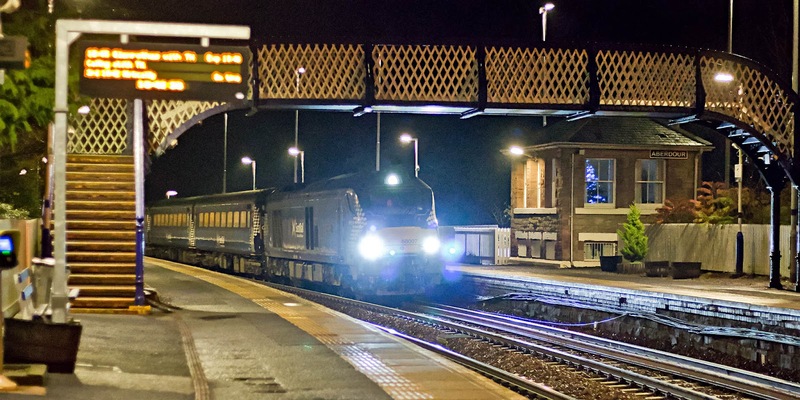 68007 Valiant arrives with 2K14 18:17 Glenrothes with Thornton - Edinburgh. The Fife Circle loco hauled is currently in the timetable until 12th May 2019. 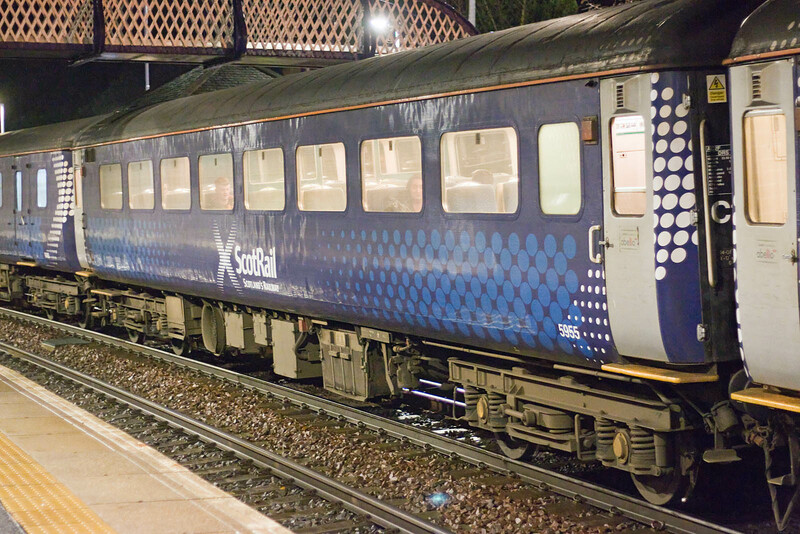 The Mk 2 slam door stock must be taken out of service by year end 2019. 68006 was on the following 5L70 empty stock working. 5955 is a Mk 2F TSO completed at Derby as the last in Lot 30846 in 1973. 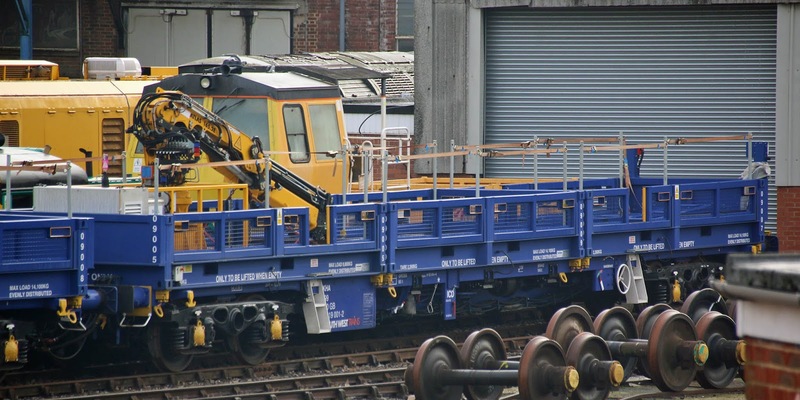 Prepared for ScotRail duties at Eastleigh Works between 16th March and 1st May 2015. 9488 is Mk 2D BSO completed to Lot 30824 in June 1971. 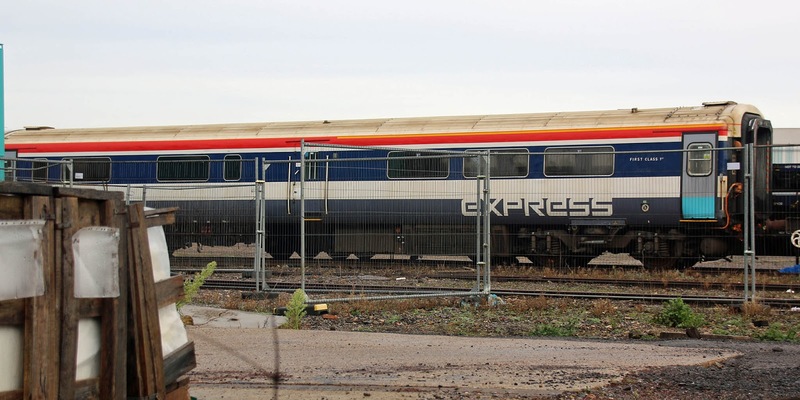 This was withdrawn from First Great Western Service in 2012, then was stored at Heaton for Grand Central, then at Barrow Hill, from where it was moved to Eastleigh for overhaul.The last Mk2D BSO in normal passenger service, in the ownership of DRS. 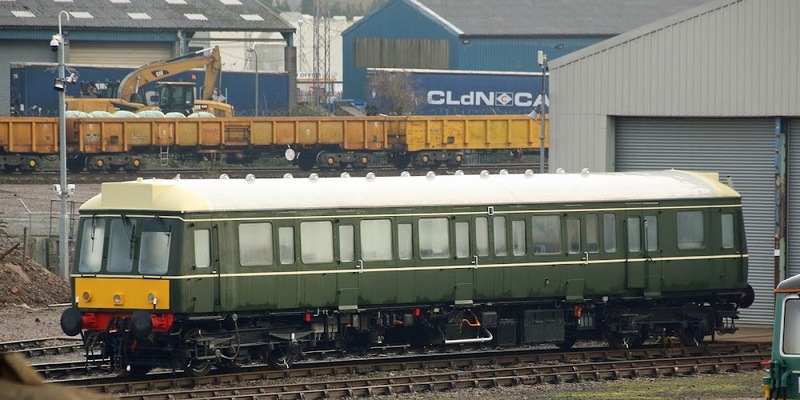 UPDATE: In discussion it has been noted that this coach also now has an accessible toiler, with window changes at the far end as seen - this may have been fitted in its FGW period, certainly before 2007. 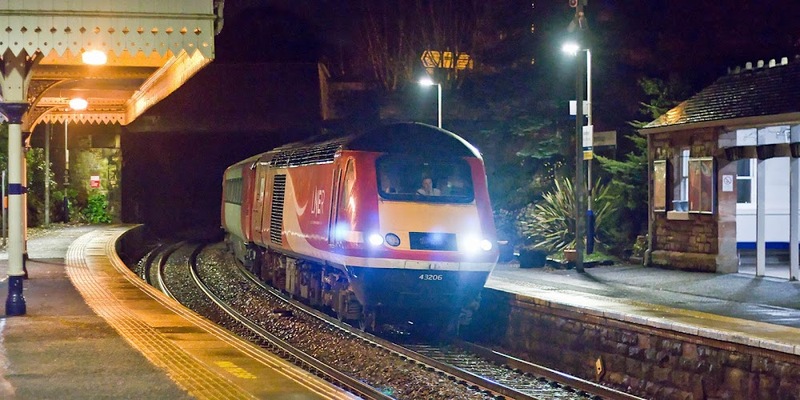 43206 leads LNER operated 1S20 14:00 Kings Cross - Aberdeen. 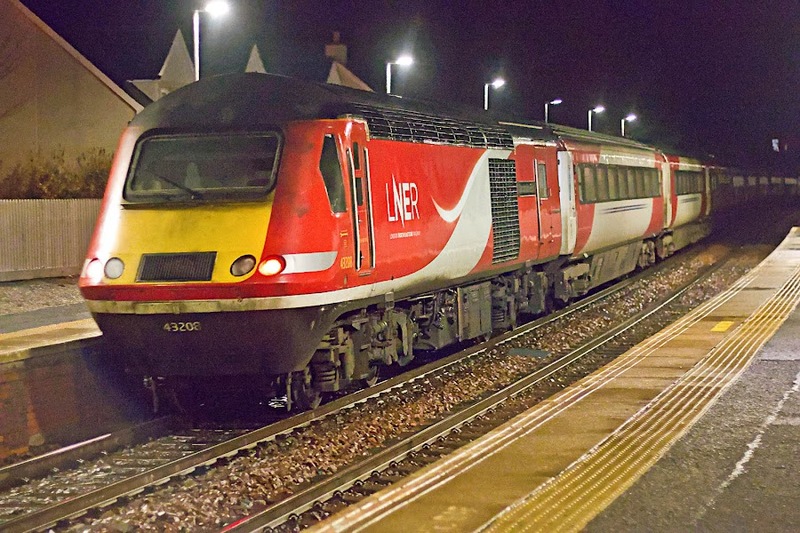 Originally 43006 delivered from BREL Crewe in August 1976, the fifth of the production level of HST power car, in Western Region formation 253003. 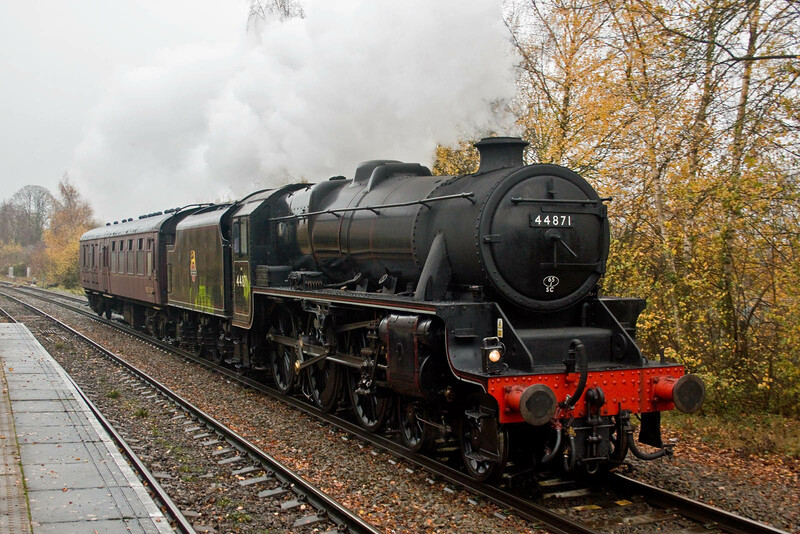 43208 Lincolnshire Echo was on the rear. Originally 43008 completed in October 1976, into 253004. Further slam door stock. 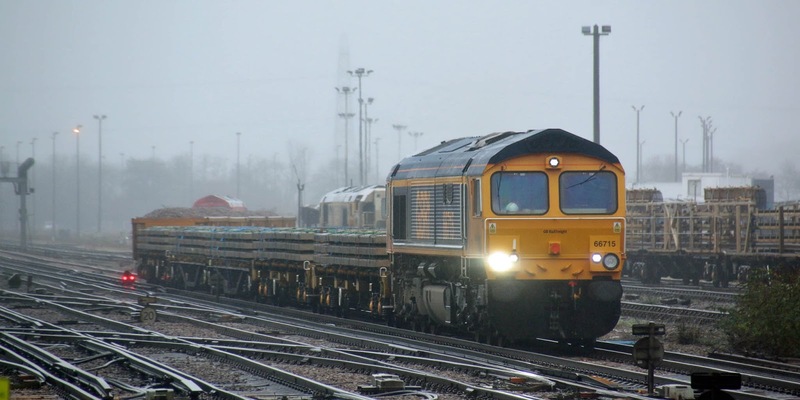 Caledonian Sleeper 73971 with 66730 at Eastleigh Works, 29th December. Image by Ian Knight. 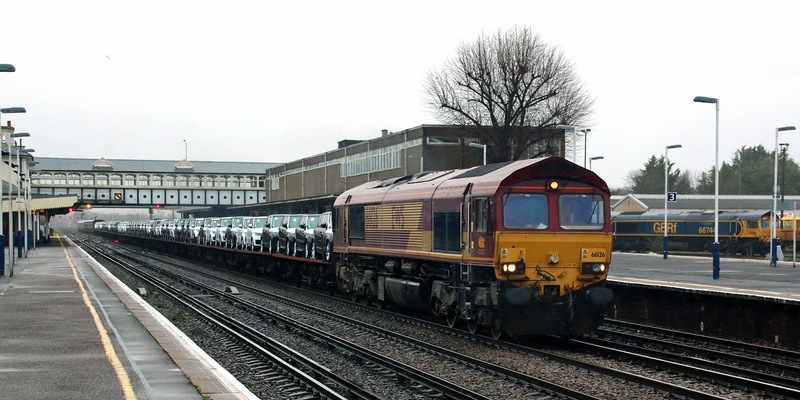 Four KHA wagons were converted from KFA at Eastleigh Works for use in pairs between the Windhoff MPVs, but after the first four wagons were converted, the project did not go forward, possibly related to the dissolution of the SWT Alliance. 99 70 9319 001-2 was the first of the group, with all four in a row on this occasion. 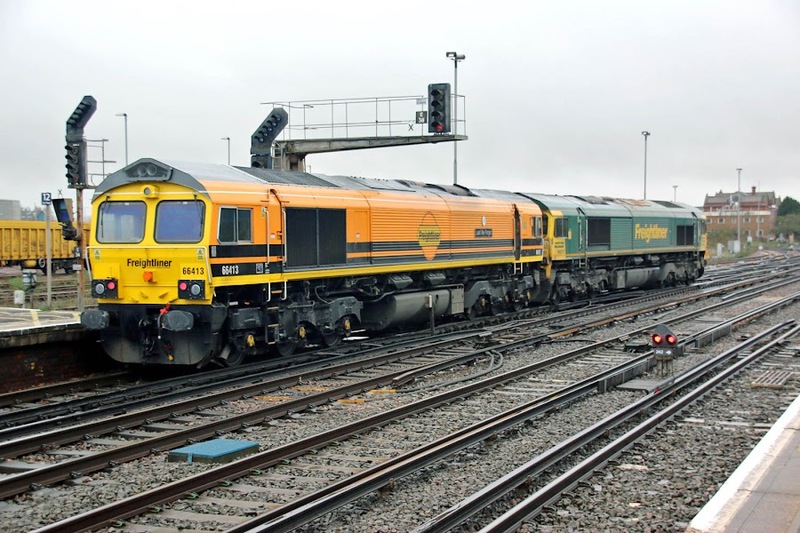 Originally TIPH 93362, later renumbered 83 70 4574 003-7 for Channel Tunnel traffic. Geismar DR 98305 lies behind. Next in line was 99 70 9319 002-0 formerly 83 70 4574 008-6, previously KFA TIPH 93309. DR 89008 is a YXA built by Cowans Boyd in 1985. 70001 back in traffic - seen on 16th at Leeds - entered traffic and ran to Southampton on 17th but then back at Leeds for some more days. 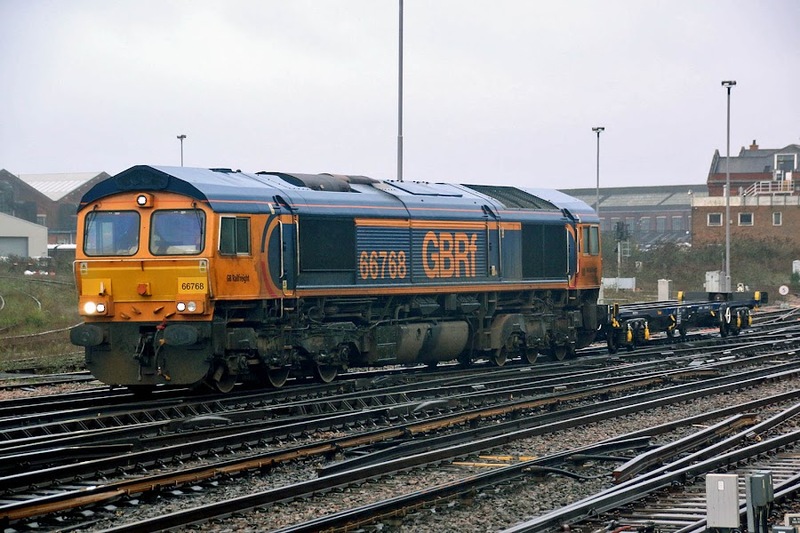 (the chosen picture is misleading as 60087 was sold earlier to GBRf, who in turn sold it to Beacon and leased back). 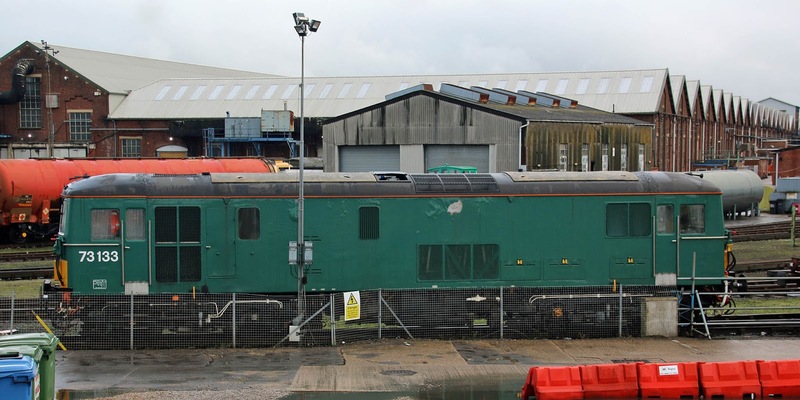 55028 awaits completion and return to the Swanage Railway. There had been rain through Saturday, and some of this was frozen early on Sunday, along with high condensation. 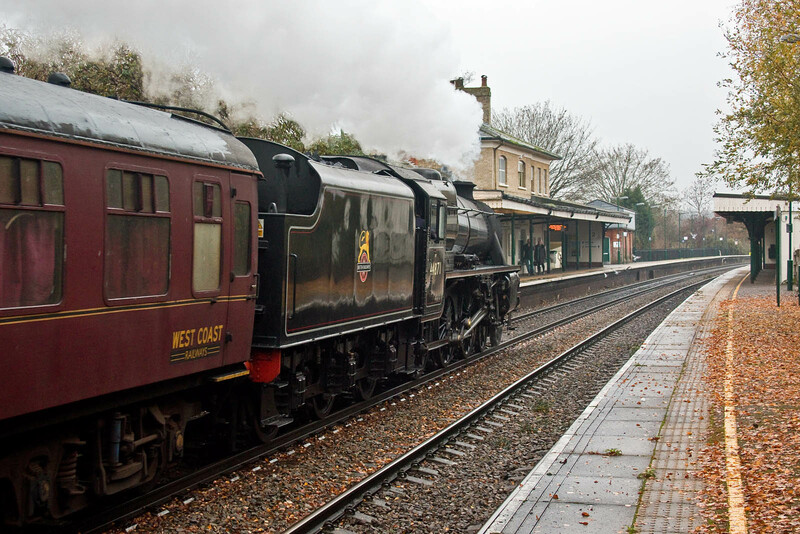 62938 has been the MBC in 5-WES 442402. For the past 30 years this was equipped with four EE546 traction motors, taken from the 4-REP units of 1966-74 build. 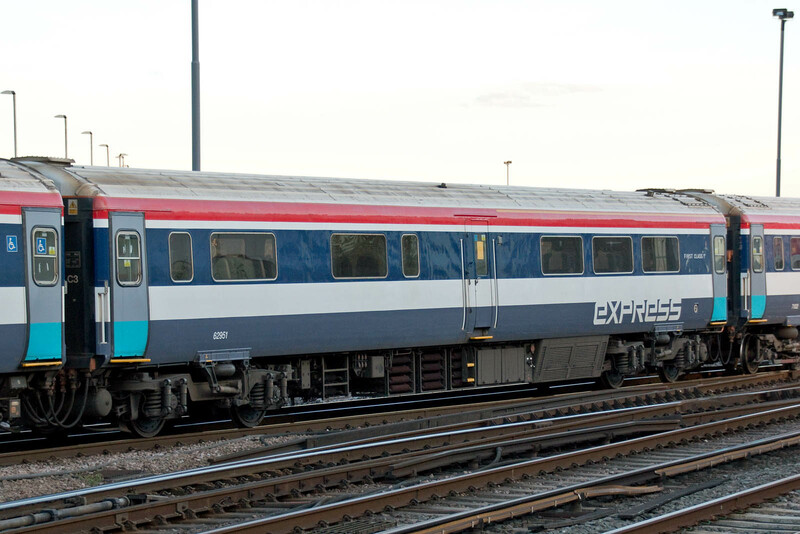 This coach is believed to be subject to a so far incomplete modernisation to ac traction from Kiepe, such that when 442402 was dragged to Bournemouth on 25th October, this coach was left behind, as was another from 442419. 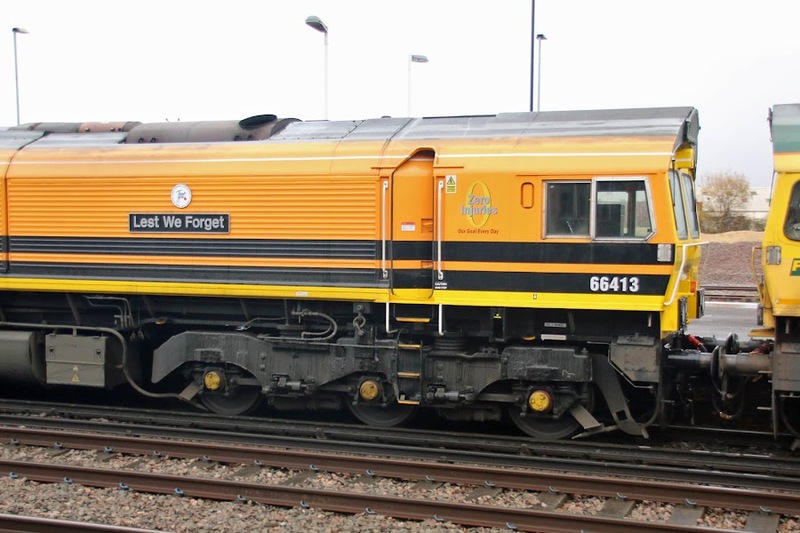 The resistor grids appear to have been removed - compare with this record shot of 62951. 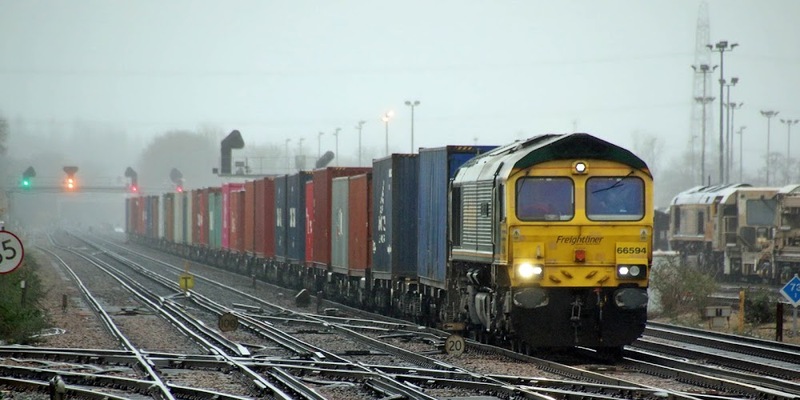 It is currently shunted to almost the end of a long storage siding - suggesting that work on it must be paused. 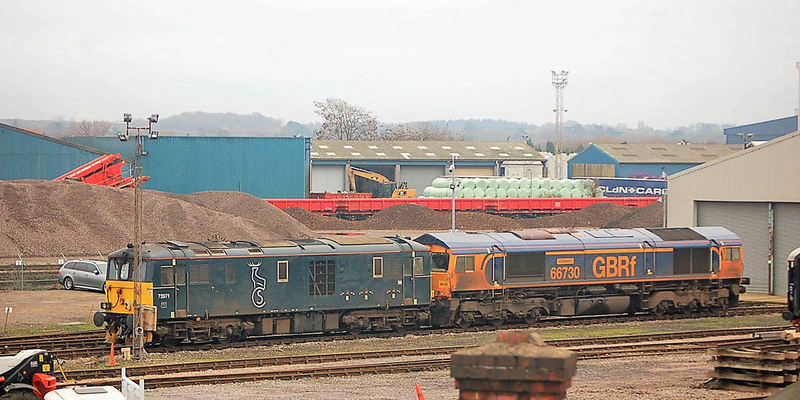 "They are stored out in the works yard, and not in a fit state to be moved to Bournemouth with the other vehicles as they are heavily stripped below the solebar due to being part way through AC conversion, and one of the two is on accommodation bogies" from WNXX Forum. 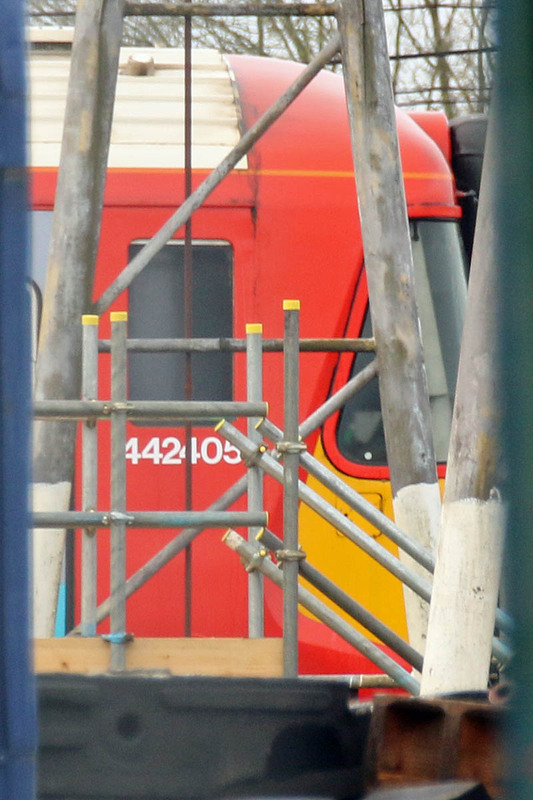 At the T&RSMD, 442405 appears not to have moved since I last photographed in May 2017. 08511 (BR Darlington, May 1958) at the T&RSMD, delivered one week previously. 70809 and 70810 parked alongside empty LWR wagons. 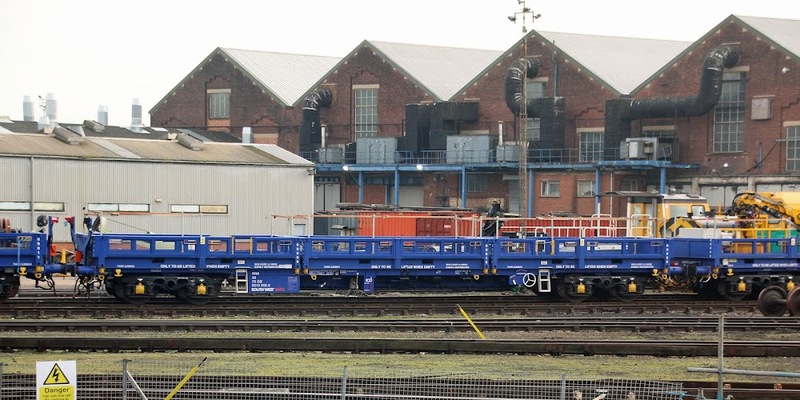 The locomotives had been working on engineering works trains 6C02 and 6C01 respectively, for work at Swanwick. 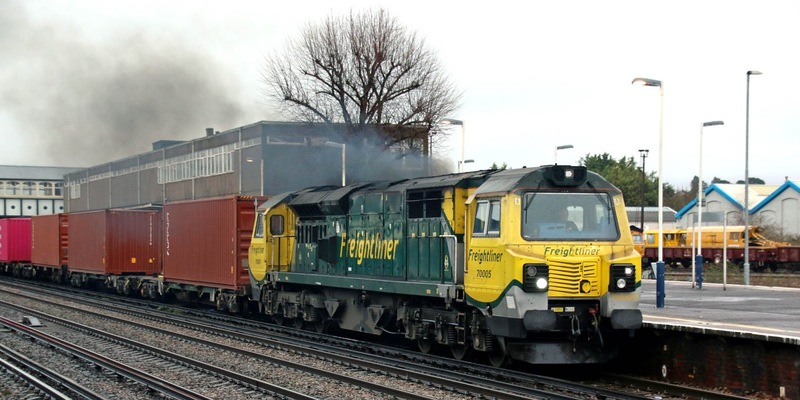 59003 YEOMAN HIGHLANDER and 66712 Peterborough Power Signalbox, adjacent to the station. 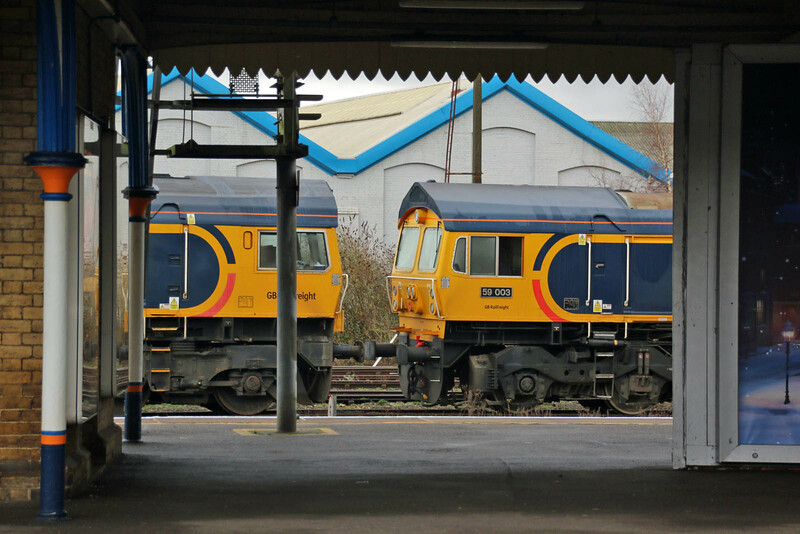 The two GBRf EMD locos viewed from within the station. Lucked out at last, also using a wider lens than before. 60062 Stainless Pioneer passes Romsey with 7O40 13:35 Merehead - Eastleigh, 14th December. 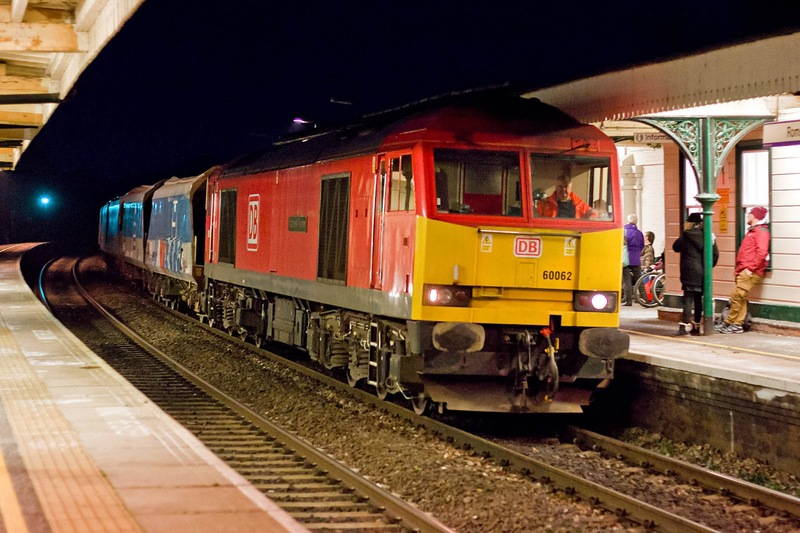 60062 could have been to Eastleigh on Wednesday evening - no visible evidence. 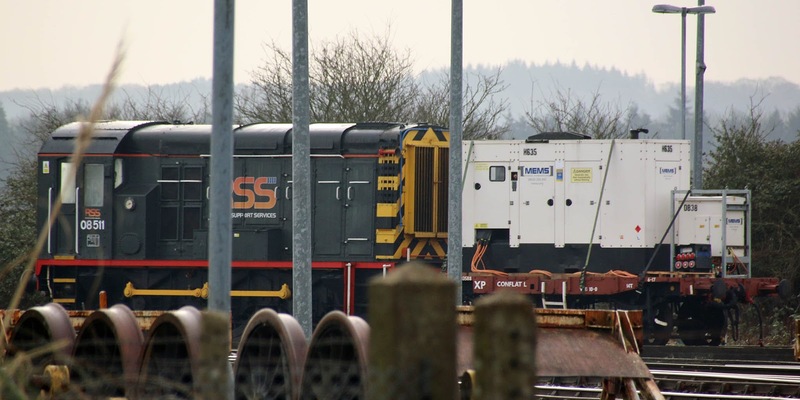 Like those in the scrap area just now, where there is no apparent change from last week, 9479 is a Mk2D BSO, now in the ownership of Locomotive Services, overhauled at Nemesis, Burton, 2015-17. 66592 4O14 07:20 Lawley Street- Maritime. 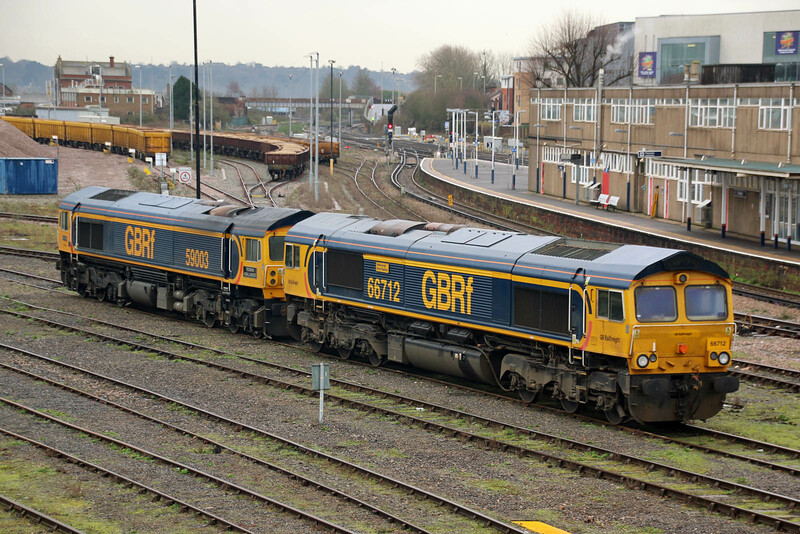 66543 4O27 05:21 Garston - Maritime. 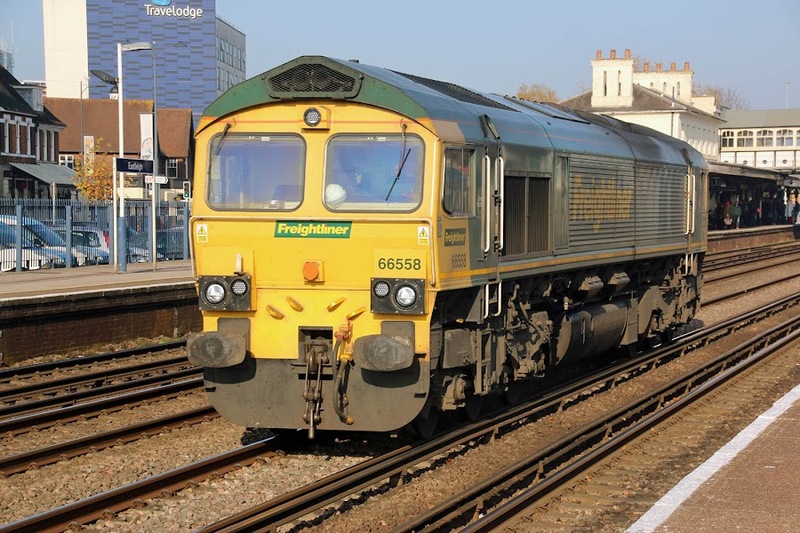 66534 66551 66550 0W26 13:50 East Yard - Maritime. 66534 arrived on 6O26 from Hinksey, the others had been on CE work. 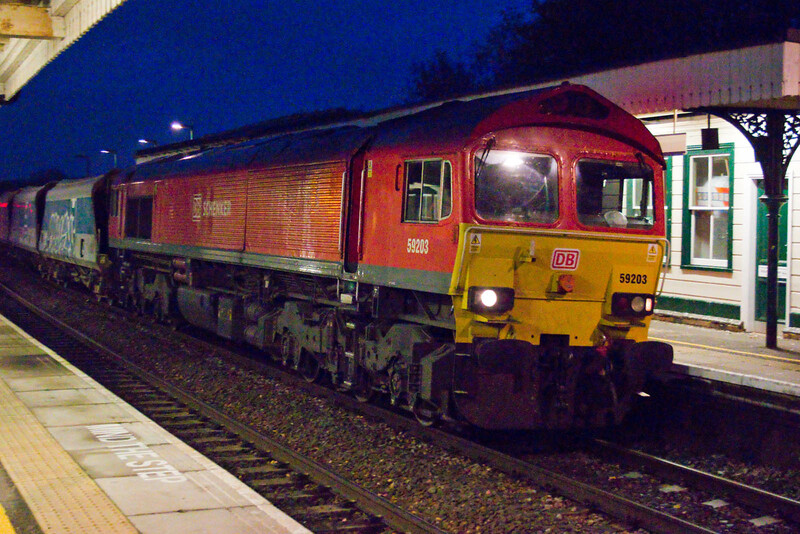 70010 4O90 05:27 Leeds - Maritime. 66768 went into the works, emerging as 4E12 13:50 to Peterborough GBRf. 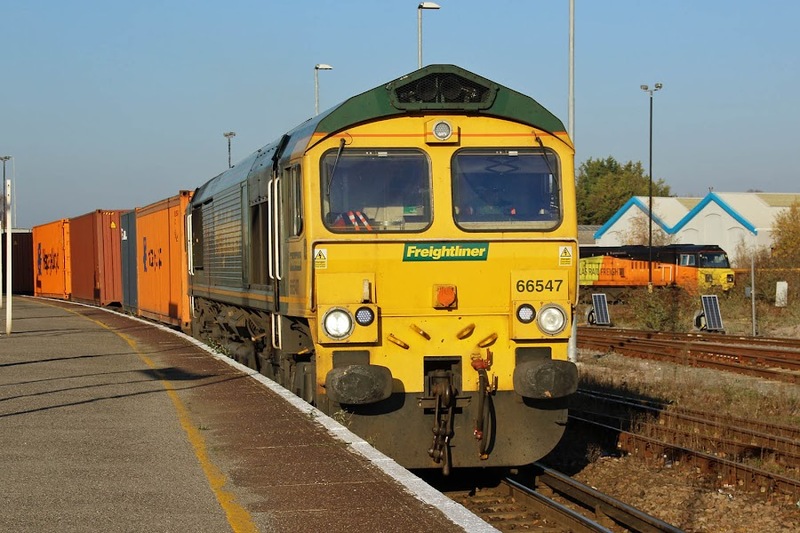 The underwhelming load was single KFA TIPH 93443, which has received bogie attention, after arrival on 11th October. 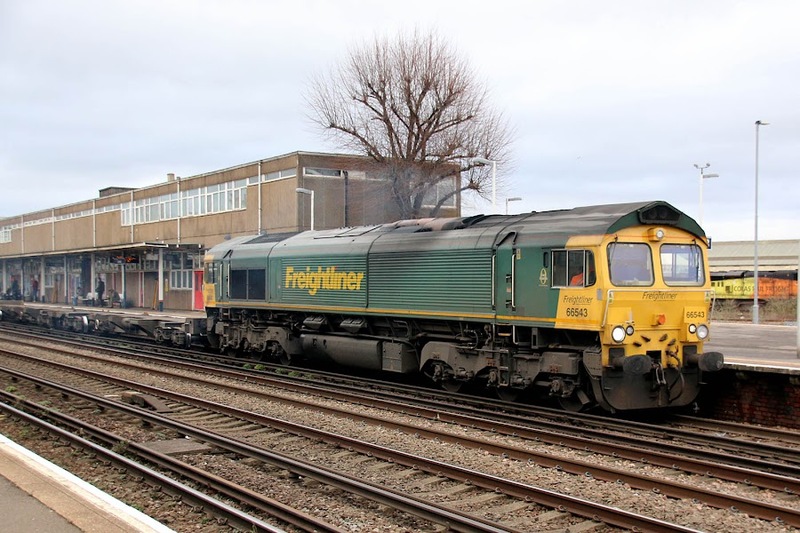 This was running for Freightliner, so it's a puzzle as to why GBRf took it to their depot. 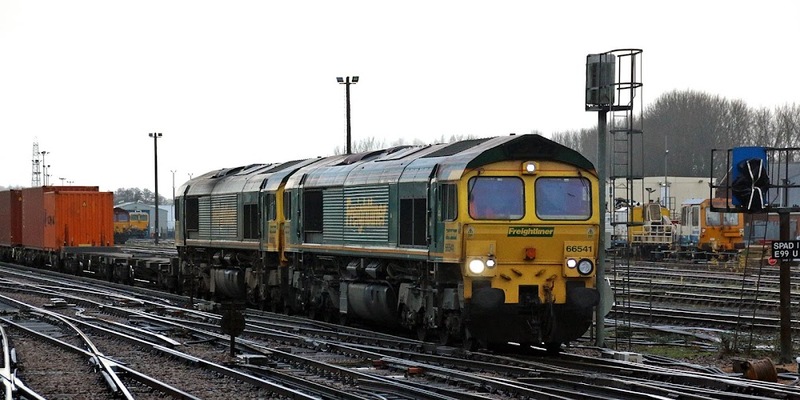 66126 6O30 12:15 Didcot T.C. 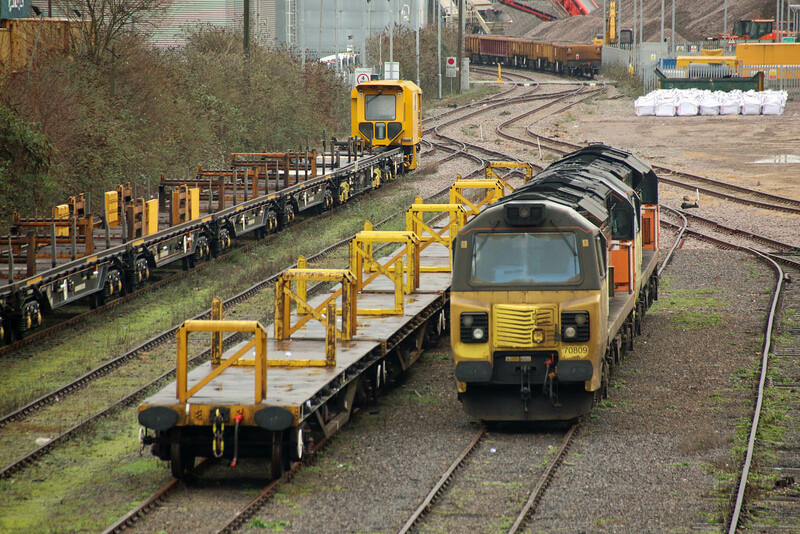 - Eastern Docks - STP onward working of Friday's 6O30 14:27 from Castle Bromwich. The light was failing at the time of arrival of 66541+ 66572 DIT 4O29 08:50 Basford Hall - Maritime. 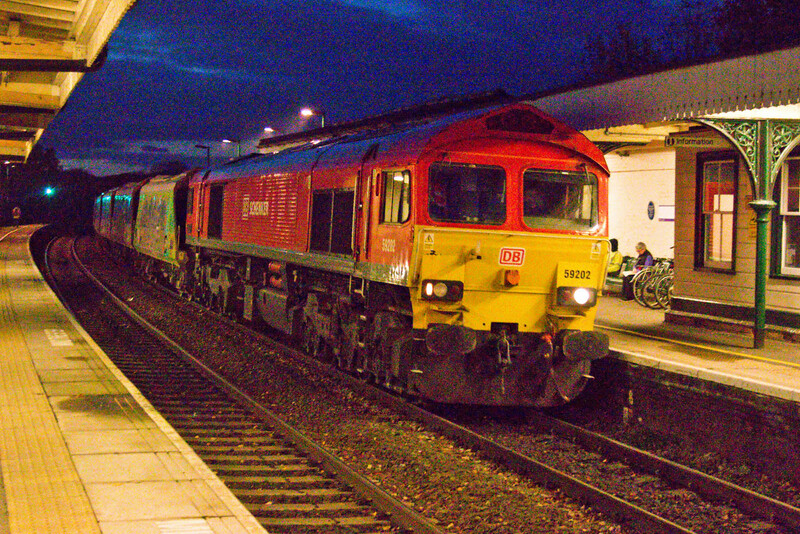 Recently reinstated 70002 at Southampton, 4O14 05:36 Garston - Maritime, 5th December. 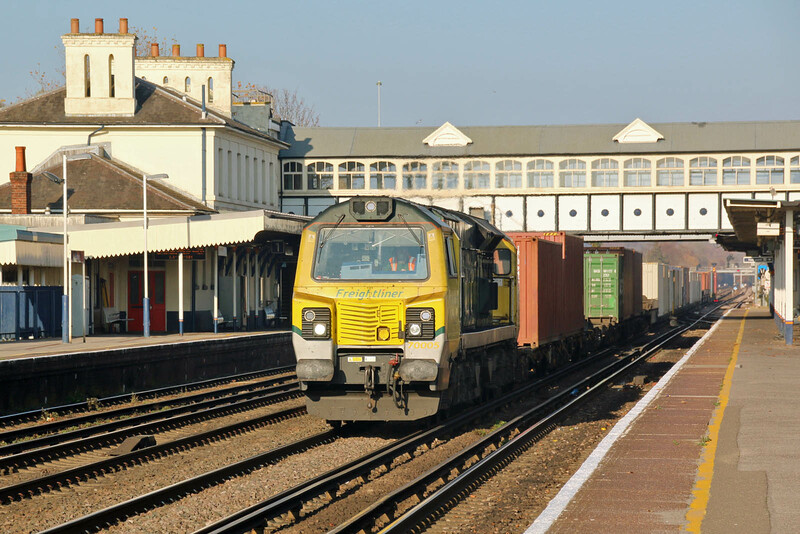 Class 442 units continue on shadow workings - the new timetable is next week. 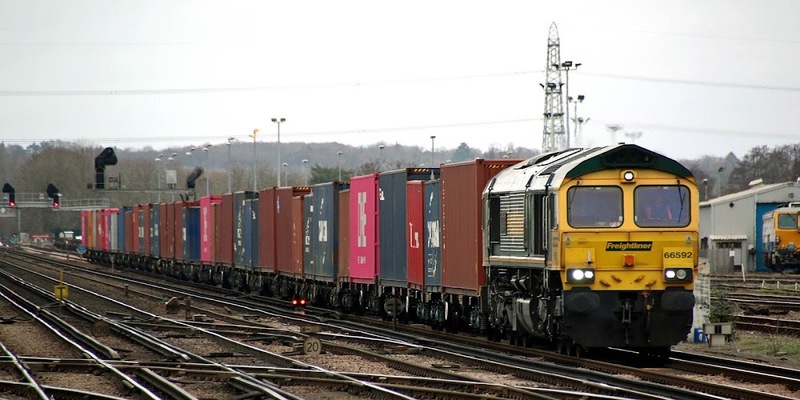 The East Usk - Maritime and return empty wagons ran on Monday and Wednesday nights, passing Swaythling in both directions. 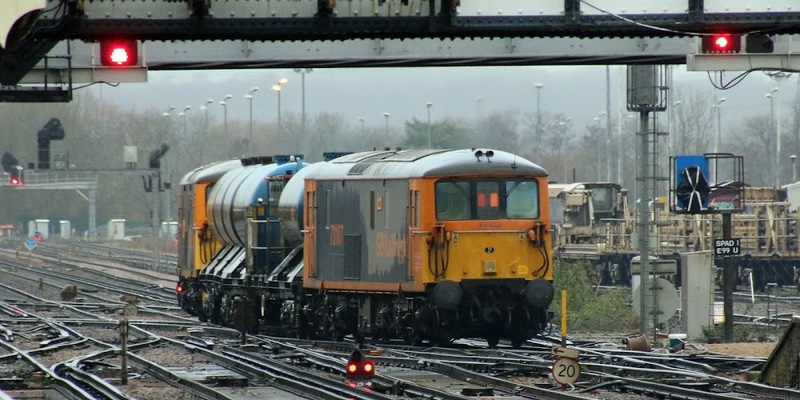 The stock of 7O40 on Friday was left in the yard at Eastleigh, and 59103 returned light engine to Merehead, the background to this is not known. 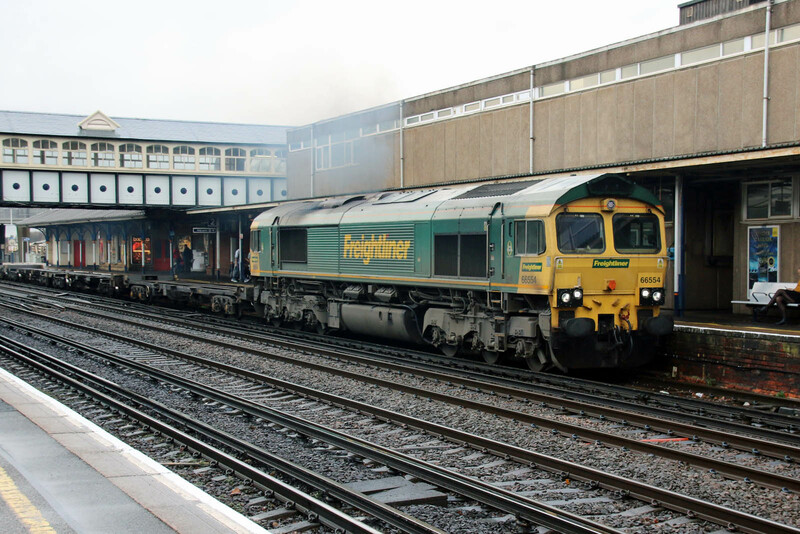 Three hours on Saturday at Eastleigh, f1.8 weather to begin with. 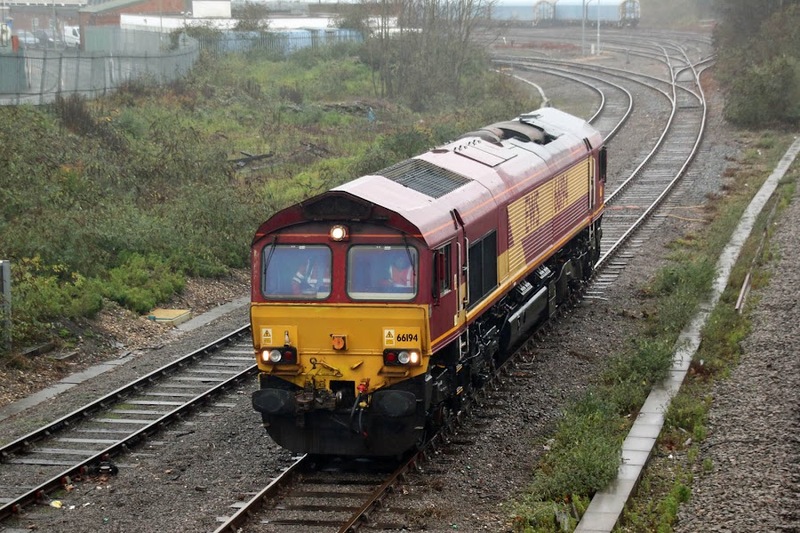 66715 Valour + 66124 on rear, 6C01 11:50 East Yard - Tinsley Green. 66594 NYK Spirit of Kyoto 4O14 07:20 Lawley Street - Maritime. 70005 4O27 05:21 Garston - Maritime. 73213 Rhodalyn + 73107 Tracy slipped through platform 3 while the Garston ran through platform 2. 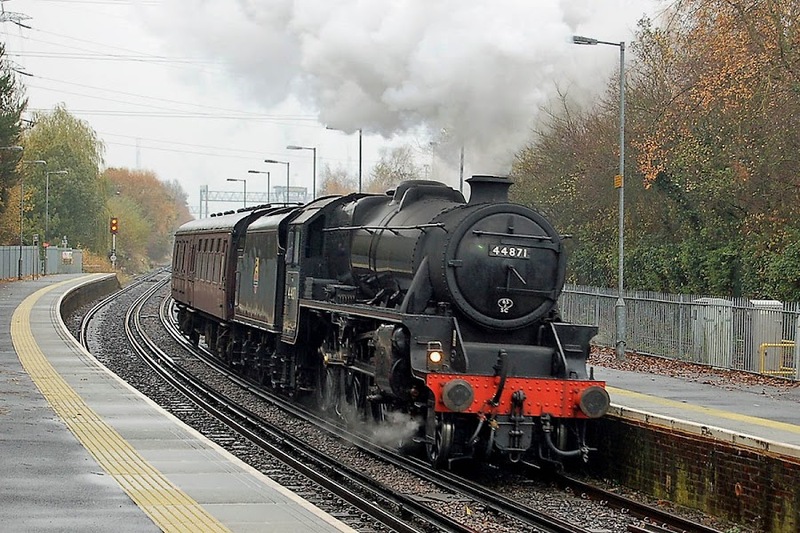 6Y91 12:35 Eastleigh - Tonbridge RHTT tanks. 66547 with 4O90 05:27 Leeds -Maritime will enter platform 3 while 158885 has arrived in platform 2 from Romsey (the first Saturday service on the Chandlers Ford line for some weeks, through RMT - SWR industrial action). 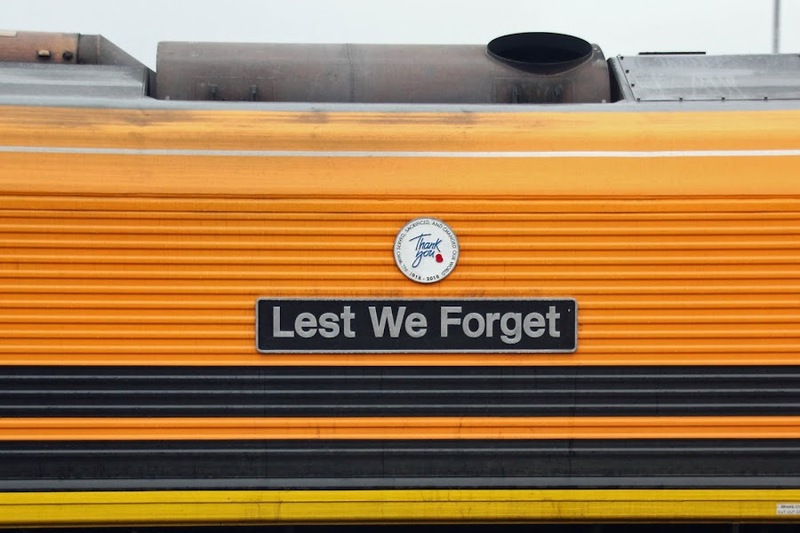 ..... which included KFA wagon TIPH 93411 (Rautaruukki, Finland 1987-88) in the consist. 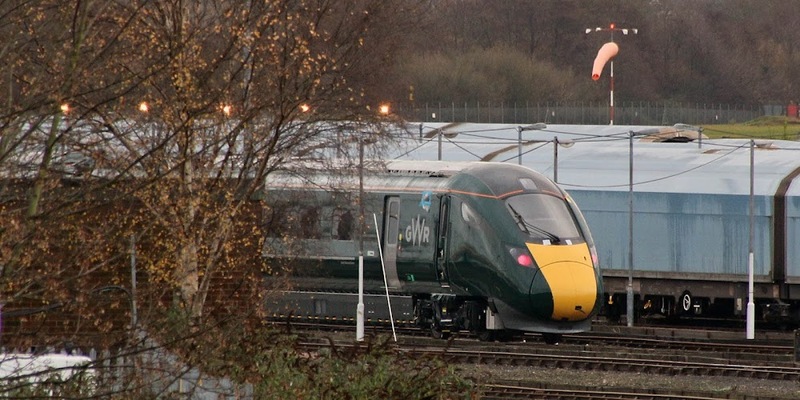 Observed from the Campbell Road Bridge, this is believed to be either of 800301 or 800312. 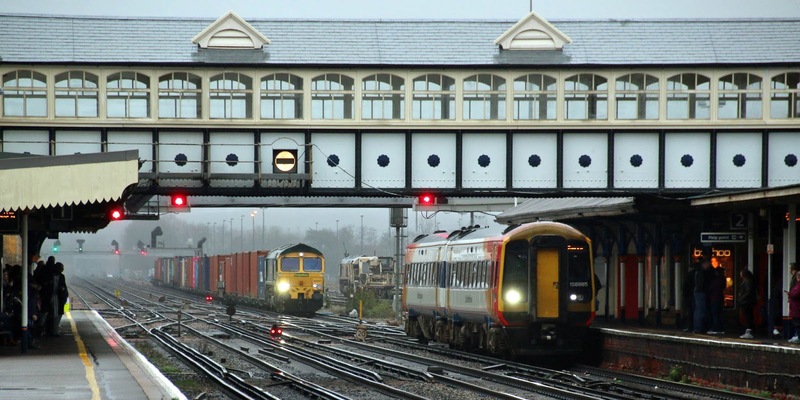 Note the plastic protection over a cctv camera location, just above the GWR logo. 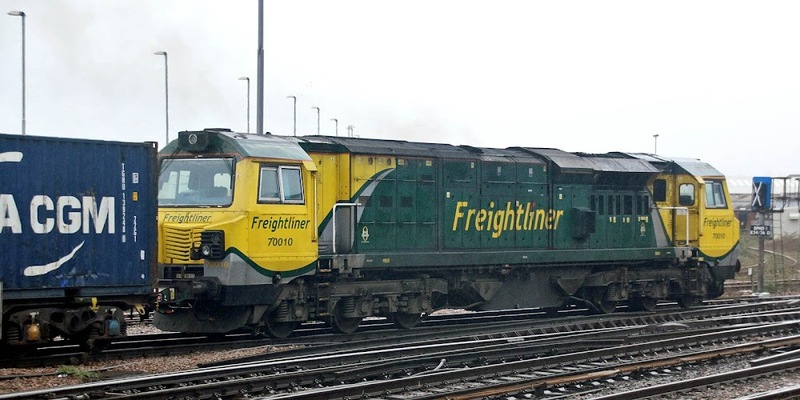 08810 was seen shunting. 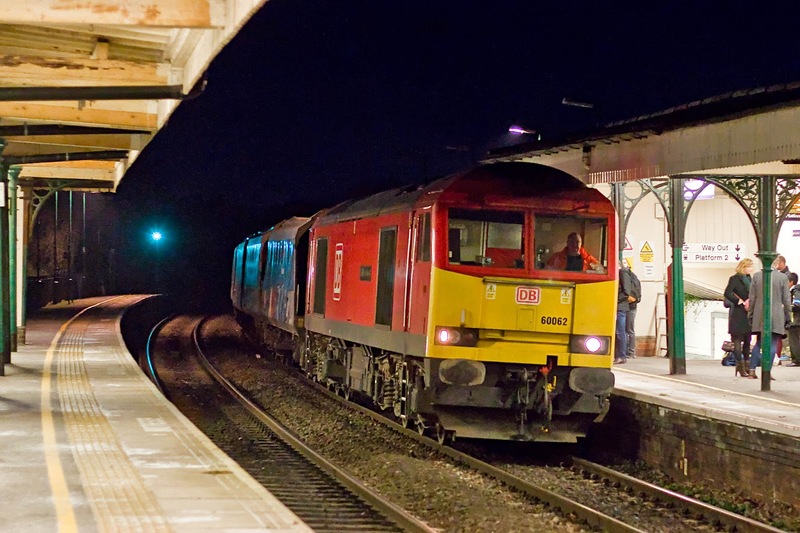 Owned by Arriva Traincare, this locomotive was delivered from BR Derby as D3798 on 9th July 1960 to 86A Ebbw Junction. Withdrawn 31st January 2004, to LNWR, and delivered to Eastleigh in December 2014. Now named RICHARD J. WENHAM EASTLEIGH DEPOT DECEMBER 1989 - JULY 1999, this name previously being borne by 08804 and 08442. 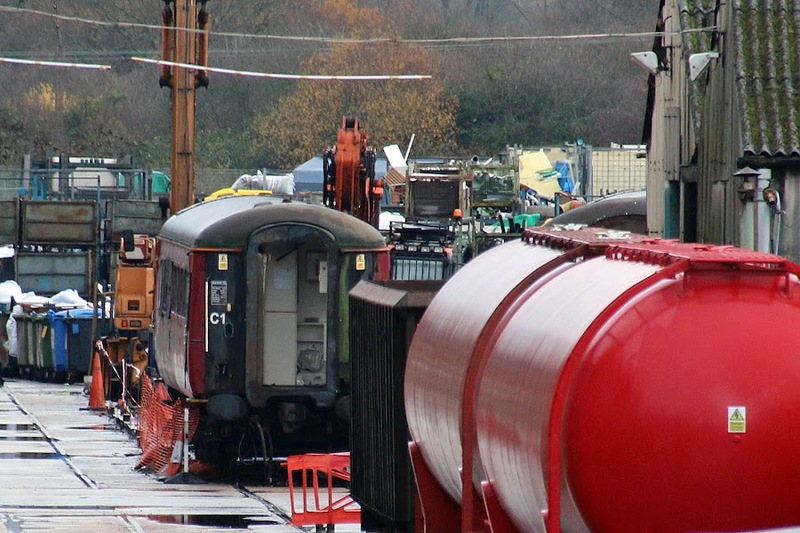 Mk 2D TSO 5632 in the scrapping area. Built at BR Derby as part of Lot Lot 30822, entering traffic in February 1971. 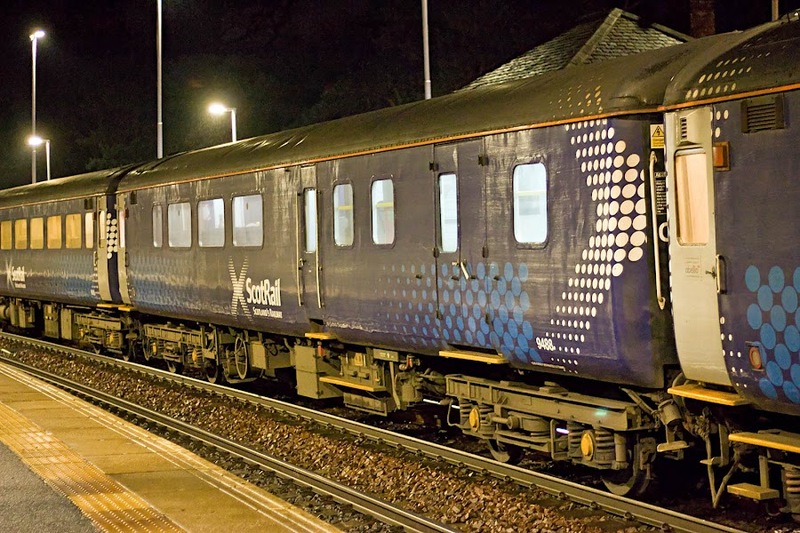 Last usage was by DBC on the Fife Circle until 2015, then one of the last three Mk 2D TSO coaches in regular use. 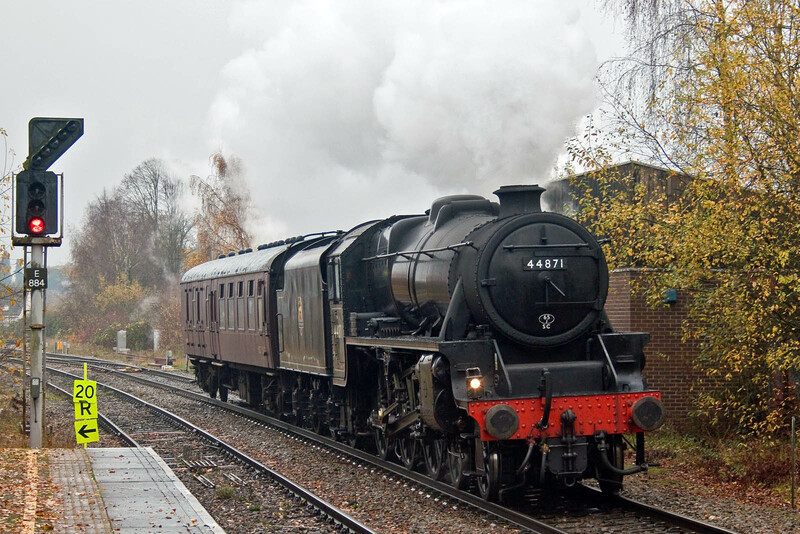 (9488 now has that title, being in the current Fife Circle sets, under DRS ownership). The coach hidden to the right is 9494, a Mk2D BSO, BR Derby Lot 30824 of 1971, latterly in DB Cargo charter stock pool PPPS, and similarly for scrap. 9522 was not visible, but understood to have been intact on Friday 30th. 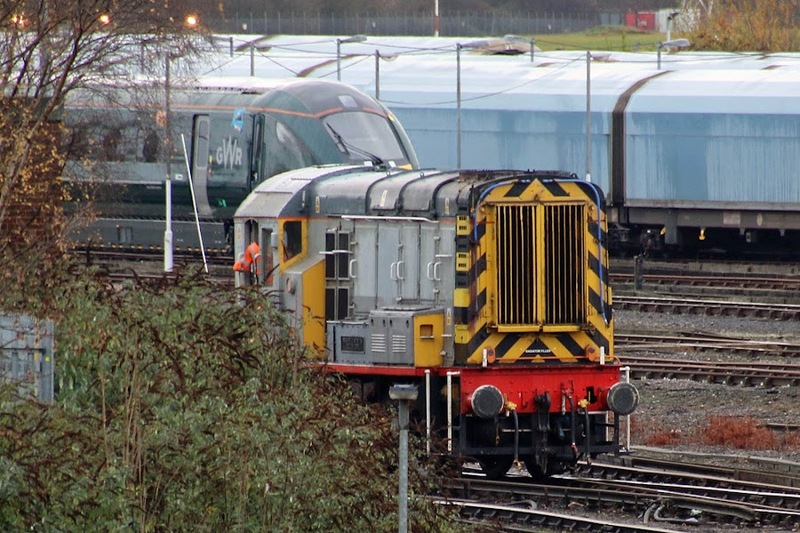 73133 resting between shunting activities. 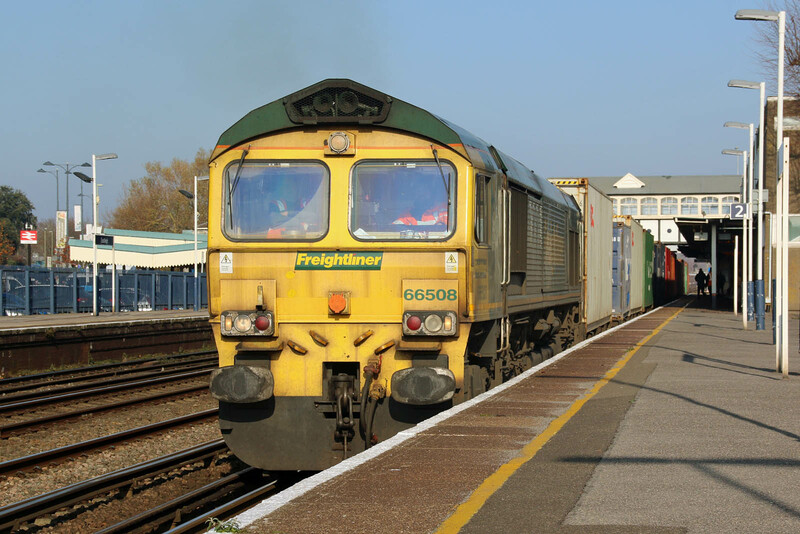 66194 coming off the shed. 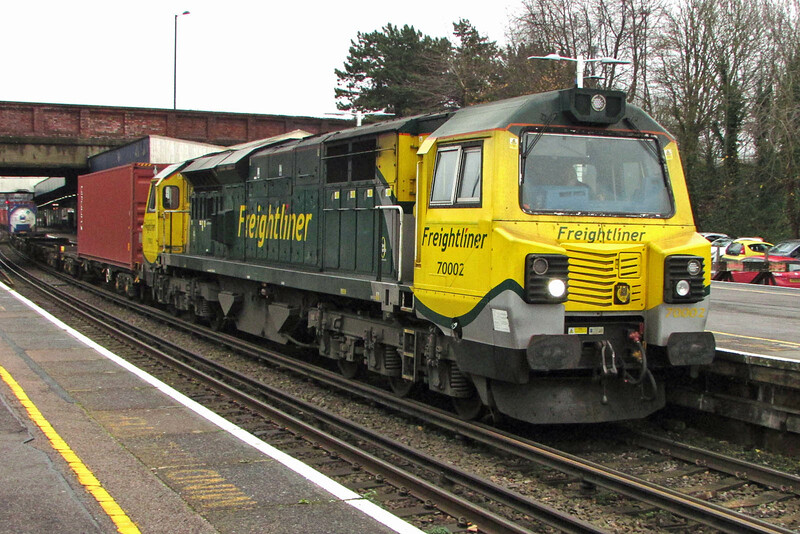 59202 passes Romsey with 7O40 13:35 Merehead - Eastleigh, 30th November. 60062 may have worked further stone train cycles in the hours of darkness. 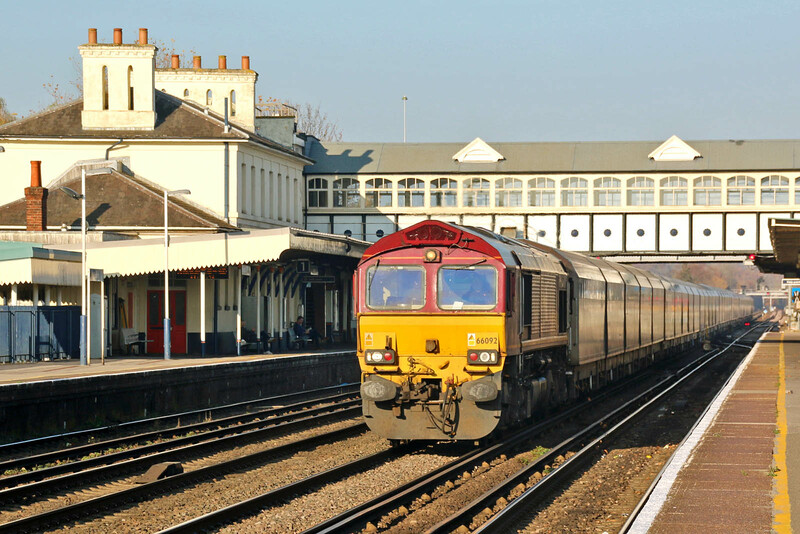 70001 is understood to be receiving attention to a traction motor and wheels, which will enable its return to traffic after about two years. 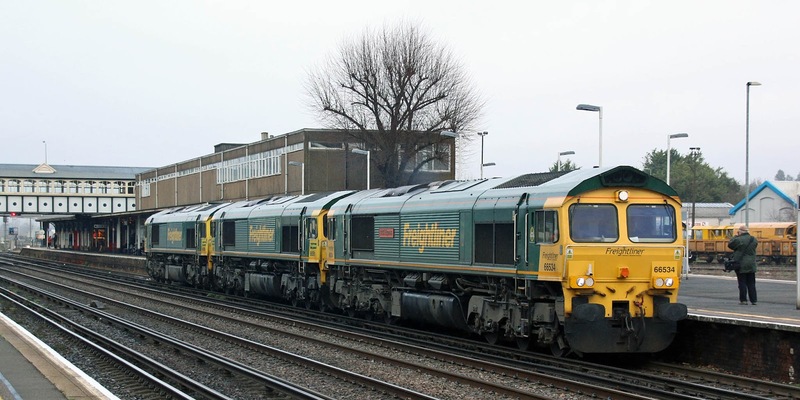 Eastleigh Works: 15Nov - 16Nov - 19Nov; TSO 5632 & BSO 9494 and 9522 are being scrapped.